One of the most common unplanned interruptions to normal daily life is an electrical power outage. Most power outages are caused by severe weather. Power lines are taken down by fallen trees or short out as the touch. Other times animals get inside distribution equipment or equipment just fails. You need to be ready for power outages. Update your phone number and e-mail address with your electric company so you can be served faster in the event of an outage. The two utility companies that service Lexington/Fayette County are Kentucky Utilities (KU) and Blue Grass Electric (BGE). Write down the phone number of your electric company and save it in your cell phone. Write the number down in your paper emergency phone list. Download the utility company’s mobile phone app. Make sure your Emergency Kit is fully stocked and easily accessible. That means flashlights, radios and plenty of extra batteries. Purchase a NOAA All-Hazards Weather Radio, program it for local warnings and make sure you install the backup batteries. Have one in your bedroom and one in the kitchen or living area of your home. 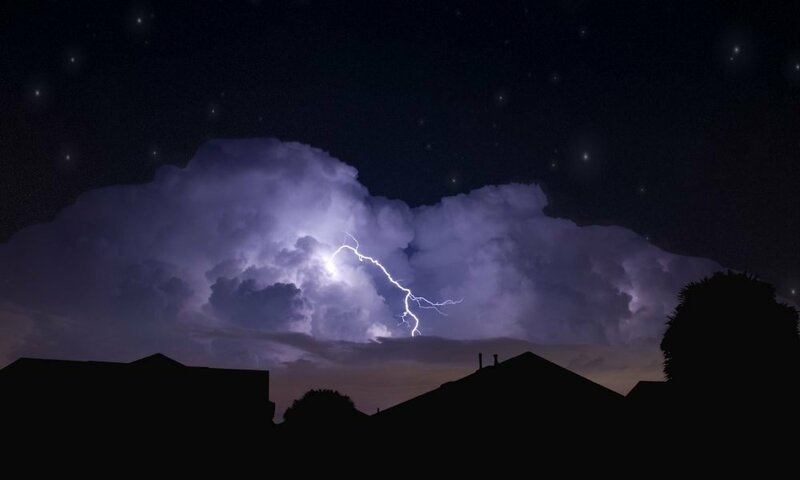 Sign up for local severe weather and emergency alerts and warning systems. Monitor weather reports on radio and television. Install fire/heat and carbon monoxide detectors with battery backup in central locations on every level of your home. Make sure your emergency plan that addresses any special medical needs you or your family members have, especially those needs that require devices that rely on electrical power. Call us at 859-280-8080 to discuss necessary arrangements. Purchase appliances with built-in surge protection or install surge protectors to help safeguard valuable electronic equipment such as computers and home entertainment systems. Plug computers and other sensitive equipment into a separate, grounded circuit to isolate them from fluctuations caused when a major appliance restarts (such as your room air conditioner or refrigerator). Consider having a lightning arrester installed at your main circuit panel. Keep mobile phones and other electric equipment charged and gas tanks full. Drive on the top half of your car’s gas tank. Report your outage immediately to your local electric company. Don’t rely on your neighbors to report your outage. Listen to the local radio station on your battery-operated radio for regular news and weather updates. Stay away from downed power lines, flooded areas, and debris. Treat all fallen wires and anything touching them as though they are energized. Immediately report downed lines to your local electric company. Turn off all appliances, including your furnace, air conditioner, water heater, and water pump. Leave on one lamp to know when power has been restored. That way, you can avoid a circuit overload and another outage that may result when power is restored to all appliances at once. Do not use a gas stove to heat your home. Generators, camp stoves, or charcoal grills should always be used outdoors and at least 20 feet away from windows. Never use a generator, grill, camp stove or other gasoline, propane, natural gas or charcoal-burning devices inside a home, garage, basement, crawlspace or any partially enclosed area. Keep these devices outdoors, away from doors, windows and vents that could allow carbon monoxide to come indoors. Opening doors and windows or using fans will not prevent CO buildup in the home. Although CO can’t be seen or smelled, it can rapidly lead to full incapacitation and death. Even if you cannot smell exhaust fumes, you may still be exposed to CO. If you start to feel sick, dizzy, or weak while using a generator, get to fresh air RIGHT AWAY – DO NOT DELAY. Call 9-1-1 and have the fire department investigate. Keep freezer and refrigerator doors closed. Food will stay frozen for 36 to 48 hours in a fully loaded freezer if you keep the door closed. A half-full freezer will generally keep food frozen for 24 hours. For refrigerated items, pack milk, other dairy products, meat, fish, eggs, gravy, and spoilable leftovers into a cooler surrounded by ice. Inexpensive foam coolers are fine for this purpose. Follow safe operating procedures for generators. Never operate one inside your home or in an enclosed space, such as a garage. If you must travel, please help protect line workers and crews when you see them on the roadside making emergency repairs. Move over from the lane nearest the workers or slow down until you can safely pass the work site. If it is hot outside, close drapes and blinds on the sunny side of your house, drink plenty of fluids, take your pets to a cool basement location, and go to an air-conditioned civic center, mall, or library if necessary to stay cool. If it is cold outside, open your blinds during the day, cover windows with drapes at night, avoid alcoholic beverages, and gather in a central room where there is an alternative heat source, such as a fireplace or kerosene space heater. If the indoor temperature drops to 55°F or below, open your faucets slightly so they constantly drip to prevent pipes from freezing. Do not hesitate to contact a physician if you have any health-related questions. Every electric company has a detailed plan for restoring electrical service after a power outage. 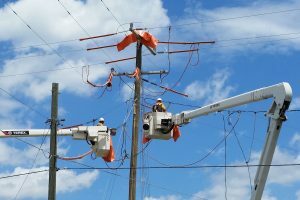 Typically, one of the first steps a company takes – to prevent injuries and fires – is to make sure that power is no longer flowing through downed lines. Restoration then proceeds based on established priorities. The first to be repaired are transmission lines and distribution substations, because they are the most important lines carrying power from generating plants to large numbers of customers over wide areas. Next, electric companies restore power to critical community services such as hospitals, police and fire protection, and communications facilities. The next priority is to restore service to the largest number of people as soon as possible. Service to neighborhoods, industries, and businesses is systematically restored, followed by single residences and small groups of customers, until restoration is complete. 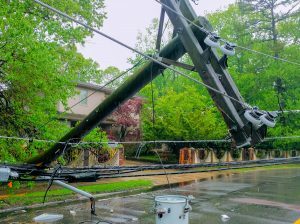 Remember that if you home is damaged by severe weather and the electric supply lines to your home are down or damaged, the power company will not reconnect power to your home until the system if repaired and inspected. Use a thermometer in the refrigerator and freezer so that you can know the temperature when the power is restored. Use this chart to help you tell if food is safe to keep. Remember: When in Doubt, Throw it Out. If the power is out for more than a day, discard any medication that should be refrigerated, unless the drug’s label says otherwise. If a life depends on the refrigerated drugs, consult a doctor or pharmacist and use medicine only until a new supply is available. Remember to turn off or disconnect appliances, equipment, or electronics before the power comes back on. Power may return with momentary “surges” or “spikes” that can cause damage. Check out actions you can take during a power outage at the Centers for Disease Control and Prevention. Also, see our previous blog posts on power outages. For more information on managing utilities, check out our page Managing water, electric, and gas service in your home.